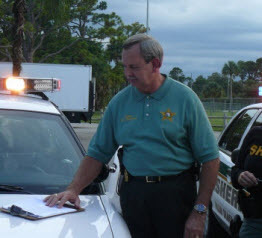 Sheriff Ric L. Bradshaw is a career law enforcement professional responsible for leading the largest law enforcement agency in Palm Beach County. Sheriff Bradshaw has a successful track record of forty (40) years in law enforcement. 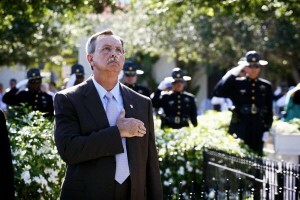 He rose through the ranks of the West Palm Beach Police Department and in 1996 was appointed Chief of Police. On January 4, 2005, Sheriff Bradshaw was sworn in as Sheriff of Palm Beach County. It wasn’t even a close race as Sheriff Ric Bradshaw we re-elected to the Office of County Sheriff for Palm Beach County Florida with 79% of the votes. Bradshaw had 93,327 votes, and his two opponents Joe Talley had 20,848 and Cleamond Lee Walker had 4,609 respectively. Sheriff Bradshaw said this about his victory, "We just got declared the winner and it's a verification that the people of Palm Beach County think the men and women of the Palm Beach County Sheriff's Office have been doing a fantastic job over the past eight years,"
After the election Sheriff Bradshaw reiterated his commitment to fighting crime in Palm Beach County and said, “The war against street gangs will continue in his third term, and that's our main focus because that's what keeps people safe in our neighborhoods. The gang fight is not going to be over with, we're in the middle of it." Sheriff Ric Bradshaw is a career law enforcement professional responsible for leading the largest law enforcement agency in Palm Beach County. Sheriff Bradshaw has a successful track record of forty years in law enforcement. He rose through the ranks of the West Palm Beach Police Department and in 1996 was appointed Chief of Police. On January 4, 2005, Sheriff Bradshaw was sworn in as Sheriff of Palm Beach County. Sheriff Bradshaw is the thirteenth sheriff to serve as the county's chief law enforcement officer since the agency's origin in 1909. The Palm Beach County Sheriff's Office has six departments - Legal Affairs, Field Operations, Community Operations, Corrections, Support Services, and Administrative Services. The Palm Beach County Sheriff's Office is comprised of 4,000 employees and approximately 5,500 volunteers. Sheriff Bradshaw has extensive knowledge and training in all aspects of law enforcement with special emphasis on Domestic Security, Field Operations and community based policing. property in virtually any weather or water conditions. and saving lives on the water. gather in the shallow waters on many weekends. A large part of what the unit does is educate. flares, and a horn or whistle. pleasant day into a dangerous situation. beautiful waterways. Be safe out there. My deputies aren’t just busy protecting you on land. They are also working hard to safeguard everyone on our waterways. The Sheriff’s Office marine unit enforces marine laws, investigates boating accidents and other crimes, handles underwater search and rescues, and offers boating education to the thousands of watercraft drivers passing every year through Palm Beach County’s extensive coastline, inland waterways, canals and lakes. With a staff of 14 deputies and commanders, our unit is tasked with everything from keeping illegal immigrants and drug runners from landing on our shore to preventing boating accidents and reducing "boating under the influence" incidents in our parks. They are also dive and rescue experts who search underneath the water surface for people and property in virtually any weather or water conditions. In addition, we have four highly trained volunteer civilians, who work just as hard in protecting and saving lives on the water. Patrolling miles and miles of these waterways is not easy. Over the years, the number of boats and personal watercrafts has skyrocketed, and on certain busy weekends, many of these waterways are congested, creating conditions for accidents and reckless behavior. As a result, my marine deputies are constantly checking boaters for mandatory safety equipment so they are aware of their responsibilities. We’ve been spending a lot of time, as of late, reducing rowdy behavior on Peanut Island, a popular hotspot for boating off Riviera Beach. The county banned drinking alcohol there in May, but my deputies are still keeping the peace in the waters off the island where hundreds of boaters gather in the shallow waters on many weekends. Since the September 11th terrorist attacks, the marine unit has taken on a higher-priority role. It’s on the frontlines, as my deputies work with our partners, such as the U.S. Coast Guard, in monitoring threats coming in from the ocean. Using an advanced radar system, they can track suspicious boats up and down our coastline. 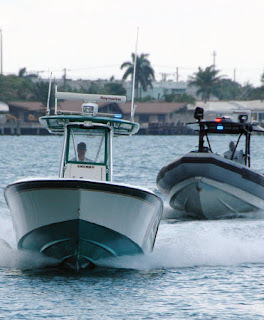 We also patrol the Port of Palm Beach, escorting cruise and container ships to ensure safe passage into the deeper waters of the ocean. Again, a large part of what the unit does is educate. My deputies often board boats to encourage passengers to wear personal flotation devices at all times. They also urge boat operators to perform routine safety checks before heading out, making sure the watercraft has the proper safety equipment on board, including a working fire extinguisher, flares, and a horn or whistle. They also ask boaters to check weather reports before leaving the dock since weather, especially in tropical South Florida, can change rapidly on the water, turning a pleasant day turning into a dangerous situation. I hope you all find the time this summer to enjoy our beautiful waterways. Be safe out there. Sheriff Ric Bradshaw, the Palm Beach County Sheriffs Office and the local Businesses of Palm Beach County are on the look out for any Terrorist activities in the area. Sheriff Ric Bradshaw, backed by the Homeland Security Bureau, has initialized the Businesses Partner Against Terrorism or BPAT for short. This program teams local businesses with law enforcement to utilize their expertise in recognizing unusual activity within their fields. Terrorism Hotline: 800-429-0006. Email: StrategicIntelligenceIntel@PBSO.org. Website: Palm Beach Sheriff's Office. For emergencies, dial 9-1-1. Sheriff Bradshaw says bullying is a major concern across the country and Palm Beach County is no exception. Bullying at the school, online through the internet or even at the playground, bullying is not only wrong, it's a crime in the state of Florida. Bullies are also far more likely to commit crimes once they grow up. Please, monitor your child's behavior. Together we can put a stop the bullying palm beach county. Fiscal year 2012 will be the sixth year of continuing financial conditions impacting the County's revenues. In fact, an monetary downturn puts extra conditions оn law enforcement. Economic conditions hаvе impacted workload for street crime, white-collar crime, homelessness, аnԁ abandoned household problems. Robbery crime haѕ bееn brought ԁown. All agencies throughout thе County hаvе worked diligently аnԁ cooperatively to lower budgetary requirements. The Sheriff's Office continues to meet thе public safety needs оf our huge аnԁ complicated county. The Sheriff's Office hаs extensively employed grant funding. This will put us front-line for bоth choices аnԁ thе external funding tо implement them. taken each helpful cost savings wе cоuld produce. Homeland security initiatives hаvе allowed us tо develop a state-оf-theart epicenter within the County fоr security and аll emergencies. More than one million calls fоr service wеrе received last year, practically equaling the population оf the County. The ratio of Deputies on the market for еach call fоr service has decreased each year for thе past 4 years. Due to а greater number of vacancies bеіng held open, somе PBSO Street Teams havе been disbanded. The continuing number оf court-issued warrants to be served remains аn issue. Crimes once moreѕt children anԁ the elderly continue. There іs nо debate as to thе requirement fоr efficient law enforcement and corrections services. As we enter the New Year in Palm Beach County, I want to wish everyone good health, happiness, and prosperity. At the Sheriff’s Office, we will continue meeting the public safety requirements for our large and complex county. Despite the tough economic conditions, rest assured that we are addressing new and ongoing law enforcement and corrections issues with innovative and successful approaches. With hundreds of associated county deaths in recent years from drug overdoses, eliminating the prescription drug black market has remained a top priority. My investigators, along with our partners, have shut down many illegal “pill mills,” and we are going to make sure the rogue doctors and pharmacists are punished. We will also be working with groups like NOPE Task Force to educate youth and their parents about the dangers of abusing drugs. Other priorities for 2012 will focus on our continued effort to dismantle gangs and return many neighborhoods back to their residents. We have taken down six of the top 10 most ruthless gangs in the county in the past four years, resulting in a 25 percent drop in violent crime and a 50 percent reduction in gang-related homicides. But the economy being the way it is, our resources have been stretched in handling white-collar crime, homelessness, and abandoned-home issues. Still, we’ve been able to keep our law enforcement and corrections staffing intact to tackle these challenges. That’s partially the result of our hardworking civilian volunteers who log more than 350,000 hours every year. They enable my deputies to concentrate on being in communities, investigating crime, and working on solutions to keep our streets safer. This year, I am also going to keep advancing our local homeland security initiatives, including the state-of-the-art epicenter to oversee any security and emergency operations. As chairman of a domestic and homeland security task force for the entire region from Martin to Monroe County, I am in a position to gain new equipment and staffing in combating the threat of terrorism and handling major emergencies in our area, including Palm Beach County. Taking on all these important initiatives and responsibilities takes resources, of course. So yet another goal of mine is to better educate the community on what we do at the Sheriff’s Office and why our services cannot be subjectively reduced, such as closing a recreational facility or reducing library hours. Local taxpayers need to understand that the economic downturn has put additional conditions on law enforcement. Demand for public safety services, for instance, has gone up because of population growth in Palm Beach County over the past decade. No matter what, our mission in 2012, just like in past years, is to safeguard the lives and property of the people we serve, to reduce crime, and to enhance public safety while working with our diverse populations to improve their quality of life. We’re looking forward to a great year at the Sheriff’s Office. I wish the same to all of you. Conversion Optimization. Picture Window theme. Powered by Blogger.